Disclaimer: I'm using OSX El Capitan, MagicaVoxel 0.97, and a program called "QuicKeys" v 4.0.7 to create the animations - your milage may vary with different versions. Disclaimer 2: This method is janky as hell. I'm working on improving it, but please take note that this workflow is a work in progress. 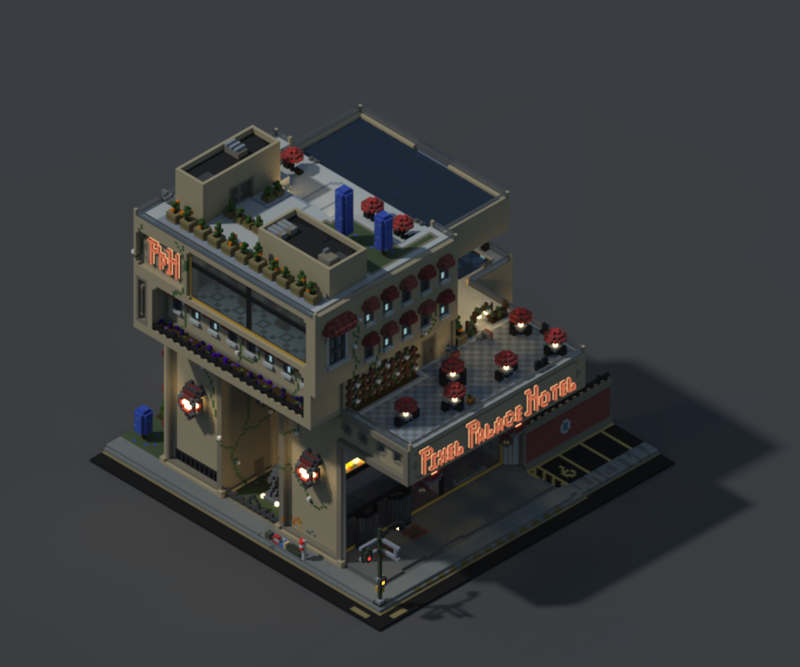 To begin, I needed a way to have the MagicaVoxel camera move between renders. I tried for quite some time to do this using the built in WSAD camera controls, sending keystrokes to MagicaVoxel using AppleScript. The problem, I quickly discovered was that Applescript seems to have a bug where it sends a "A" keystroke if you try to send a key down command - no matter what input I sent to MagicaVoxel, the camera would only pan left as though the "A" key was pressed. Crap. The workaround that I found was to bring in another app, one with a little better keyboard/mouse scripting - QuicKeys. The program has a 30-day free trial, and I've been pleased with it so far. 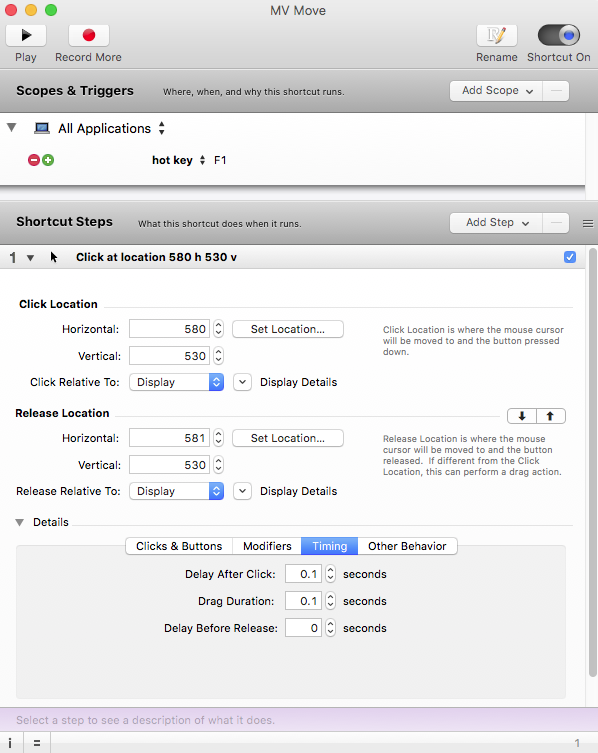 Its available here, or you can just do what I did and google "osx automate mouse" and follow stackoverflow to the program. As a sidenote, I generally hate using third party programs like this, especially for one-off processes, so if anyone has a better way to script mouse movements, I'd love to hear about it - hit me up on twitter. With QuickKeys downloaded and installed, I needed to create a few macros to move the MagicaVoxel camera around. I opted for the simplest setup I could - my macro would run when the "f1" key was pressed and would drag the mouse from a point on my monitor to 1 pixel to the left. Obviously you'll need to adjust the starting and ending coordinates from my example depending on your monitor size - I'd suggest using the "Set Location" button for the Click Location, then copying and adjusting by 1px for the Release Location. This setup is dependent on your MagicaVoxel window position, so I maximized my MagicaVoxel app to give me the most working room. Once done, save your macro and test. Bring up MagicaVoxel and press your f1 key - the view should move just slightly. You can use these macros to orbit in any direction or pan up/down/left/right. Breaking it down, the script loops through a set of actions a bunch of times: 1) move the camera 2) render the scene, and 3) save a screenshot. I just had the system press our "f1" and "f2" hotkeys to run the camera macros to accomplish the move, rendering is done automatically by MagicaVoxel - it just needs time to complete, and applescript is sufficient to save a new file screenshot. Feel free to grab/use/improve the script - you can adjust the number of renders and render times for different results. Ok, almost ready to run. Now I set up my MagicaVoxel scene: I set MagicaVoxel to render mode and set up my scene sky color, fog, emissive voxel colors etc. Once that was done I did a test render, and set my save folder using f6 - I would suggest using an empty folder to save your files in, to make creating a gif easier later. Once that was done, I set my initial camera angle and ran the applescript! My first run was 500 frames at ~40seconds rendering time per frame. I had to let it run overnight to finish. The results were good, but only the first 200 frames were usable - a good 300 frames the subject was no longer in frame. My second run I did 300 frames at 90seconds per frame. I also doubled the rendered screenshot size from 400px to 800px to get a clearer image. With the rendering done, I now had a set of 200-300 images that needed to be stitched together into a animated gif. There are a ton of great ways to do this - I used the imagemagick library available here, though you might prefer something else if you're not comfortable using OSX's terminal. to create the actual gif. And that's it! I hope this writeup was helpful to at least a few of you - I'll continue to improve it as I refine the process. If you have suggestions to that end, or just want to show off the sweet images you make, tweet me at @drinkdecaf - I'd love to hear from you!